I was playing in the courtyard with the kids and struck a conversation with some of my nice neighbours who happen to be really well-raised, well-behaved teenagers. One of them was teasing her sister over how late she woke up that morning. - It was only 10, said the 12 years old. - 10? I couldn’t help but say. Wow, you’re lucky. I so wish I could be a teenager again! My baby wakes up between 5 and 5:30 every morning! - And you let her do that?, asked the 16 years old. - What can I do? I can’t FORCE her to sleep. I mean, I did consider throwing her out with the garbage, but it’s not exactly legal, so I decided against it. And then I laughed, because they were looking at me with their eyes wide open. Do I really look like someone who would throw away their child? Of course, it was a joke! But I will admit that right now, sleeping in until 7 would be heaven. Even just once a week. And I am going back to work in 2 weeks! I’m not sure how I’m going to do that. I mean, you have to keep your eyes open in order to get paid, right? Yeah, I thought so. Bugger! Are you going to get dead? Since Tuesday I have been very worried. Of course I worry about my son’s friend who will be fighting for life and more than likely losing that battle. I have been worried for my friends who will lose their child and still, somehow, have to find a way to continue for their other child. But humans being what they are, I have mostly been worried sick for my son. I wonder how he will react to the death of his friend. I understand that children that young cannot quite comprehend death, at least not as something that is forever. And he has never showed that much sadness around death – our fish or his great-grand-uncle. But those were not as big a part of his life. They went away, but they didn’t leave a big hole in his life. We have always tried to be matter-of-fact around death because we don’t believe in lying about it. We don’t believe in God so we are not going to tell him stories about his friend watching over him from a cloud in the sky. As another friend has said: the curse of being an atheist. We have always tried to keep our cool around death. But this is something else. Eventually, he will see his friend sick. We are not going to shield him from that, because if his presence can make it easier for his friend to go through chemo, and of course if our son is ok with that, we will allow him to spend time with his friend. He will surely see the sadness surrounding the whole thing. And I’m sure he will see me cry. Because I will. And again, I don’t want to lie to him. If he wants to go to the funeral, I’ll encourage him, because I think it’s healthier in the long run. Death is a part of life, and modern society has a tendency to want to forget it, but it’s true. Still, I wonder what effect it will have on him. Will he brush it off and continue unscathed? Will he be changed forever? Will life be different for him after losing a very, very good friend. I don’t know. All I can do is brace myself and try to get as much information as I can about the best way to help him go through this. Do I wait before I tell him so he doesn’t worry for too long (months can be very, very long when you’re four)? Or do I tell him way ahead of the end so he has time to prepare himself, to grieve, and especially, so he doesn’t start worrying that everyone else around him could disappear overnight? How early is just right? Will he have nightmares after that? It could be a life-changing experience, one that I have never been through. Or it could just be another normal event that he will just brush off, a bump in the road. He has other friends. He might be just fine. I don’t know. And it drives me crazy. We can only wait and be ready to pick up the pieces. I’ll make sure I hug him very tight when he needs me to. Parents spend so much time and energy trying to do “the best” for their children. Get them toys that will give them learning opportunities. Read to them so they like to read. Breastfeed them so they are smarter. Give them an edge by paying for tutors even before kindergarten. Get them into the best schools. All of that… What a waste it is if your child dies before grade one! My baby has her second tooth. It’s on the upper gum this time and it won’t feel lonely for very long since the other two front teeth – top and bottom – are already visible just under the gums. So soon my little girl will have 4 teeth. Given how easy it seems to be for her to eat with only half of one, I’m guessing she’ll soon be having her corn straight from the cob! She is also saying something that sounds like “Dun”, which at first we thought was “done” but the context was all wrong.. until Zak realized (or at least that’s the current theory) that she was saying “donne”, in French, which means “give me”. It works a lot better since it is usually addressed to us while we are holding food and not feeding it to her fast enough. It had to be the English parent understanding that the baby actually speaks French! My daughter took her first step. Well, sort of. To be fair, I am the only one who saw it and if I had blinked I would have missed it. It was more like a lounge followed by a crash. Granted, she is only 10 months old. She is now able to stand up on her own for a few seconds – wait, make that most of a second. Then she collapses. But today was the first time that, while standing balanced by herself, she put a foot forward. Then she collapsed. But here it was. Her first step. I would say she’s on track to be walking before her first birthday. Not that there is any rush. She can already get into so much trouble, I don’t even want to think of what it will be like when she can walk. 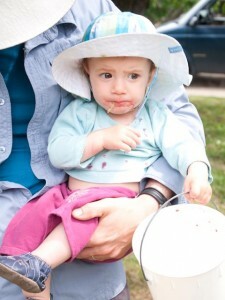 Just yesterday, we were picking cherries and she was in her dad’s arms. While he was talking to someone, she managed to grab a cherry. When I turned around, all I could see was the stem of a cherry coming out of her mouth. She had a huge smile, and her shirt was covered in cherry juice (it still is, by the way). You gotta love berry season!